Electric-powered trolley buses used to grace our city and were able to move to and from the curve without halting all lanes of traffic. The City of Toronto Aug. 16 released the latest set of data on the King Street Transit Pilot, a transit-priority pilot project on King Street from Bathurst Street to Jarvis Street. • A [miniscule]0.3% growth in customer spending on King Street since the pilot began as compared to the same months from the previous year. That set of data includes results from May and June of this year and is available on the city’s website at https://bit.ly/2MOGy6G. The pilot project is being monitored for impact on transit service, traffic flow on parallel streets and effects on pedestrians, cyclists and local businesses. King Street business owners I have personally spoken with generally abhor this stupid streetcar gimmick on a busy Downtown venue. And what we are seeing except for a half hour or so each way are monstrous sparsely populated streetcars. So many businesses are made to suffer when it’s the streetcars that clog traffic, not the cars. Streetcars are an idiotic form of big-city transit unless they’re on non-major roads. And even then they’re just stupid ways to keep the manufacturer, Bombardier, in business at your expense. Buses and trollies make sense because they have tires so they can move to the curb for passenger pickups/departures and let motor vehicles continue rolling. Do you agree? Let me know. 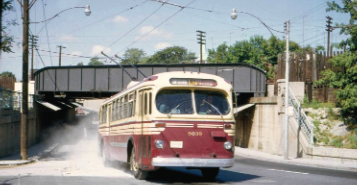 And, by the way, try finding a photo of those old Toronto trolley buses which were still in service when I moved here in 1961. Their images have been scrubbed off the Internet as if they never existed. Don’t you wonder why? I always thought that trolley was another name for streetcar. Obviously, they are both streetcars, but they have one important difference which the author points out. (And, I assume, tires means brakes that don’t use sand, although there are still particulates generated with brake pads. Which is worse then?) I agree completely with the authors view of streetcars and the powerful, uncaring special interest manufacturing our transit vehicles. I can’t believe how wrong they got it. The new streetcars are too big, blocking traffic when they turn some corners where the end of the car has entirely entered the right lane but can’t go further until the light turns green. Visibilty is reduced for passengers due to bulky interior designing. There’s no pull cord! And call buttons are too few. (And Presto looks like a nightmare to me.) I haven’t started using it yet and am not looking forward to it). TTC managers are jokers. They seem to pay zero attention – for whatever reason – to what’s going on with transit. They have bosses, so maybe that’s where the blame lies. But this business of obsessing over schedules is nuts. I’ve been on STUFFED buses and streetcars, in the heat, waiting for the thing to move, but it doesn’t. Guess why? The driver must conform to his schedule. I’ve seen buses arrive at the station, let those on who are right there and leave, all within the space of about a minute, with the bus all but empty. Guess why? And I’ve found the king streetcars, even without the congestion to hold them up, to be stuffed. That’s because there aren’t enough TTC vehicles on the road. Why? I call it sabotage. 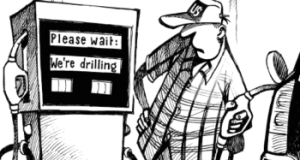 Make the whole experience bad enough and politicians can score points complaining about socialist transportation, as they proceed to aid and abet the privatizers who you know are waiting in the wings to do their thing here. There’s a big difference between simple inefficiency and/or incompetence and sabotage, but the movers and shakers understand that people will not be critical in their assessments when the whole system comes up for review. They’ll just complain and whoever offers ‘solutions’ will get their support. The few of us who pay attention will pay for the adoption of capitalist solutions that get foisted on us, but we won’t deserve to.